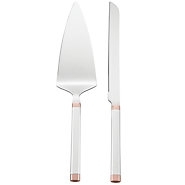 Clean lines and a spot of color are the hallmarks of the contemporary styled Aegean Rose Stainless Cake Knife & Server. Comprised of a cake knife and server, this silver-plated serving set is ideal for cutting wedding cake, and will be a welcomed addition to any household for years to come. Makes a lovely housewarming gift, too.